Wild River Press is proud to present this high-quality reprint of one of the greatest grouse books ever written—and illustrated. For William Harnden Foster was not only a fine writer. He was also a classically trained artist. His mood-capturing paintings, charcoal drawings and pen-and-ink sketches of gunners and their bird dogs roaming the half-overgrown farms and tumbledown stone walls of early 20th-century northern Massachusetts and southern New Hampshire are among the finest ever created. His lyrical writing is the perfect match. 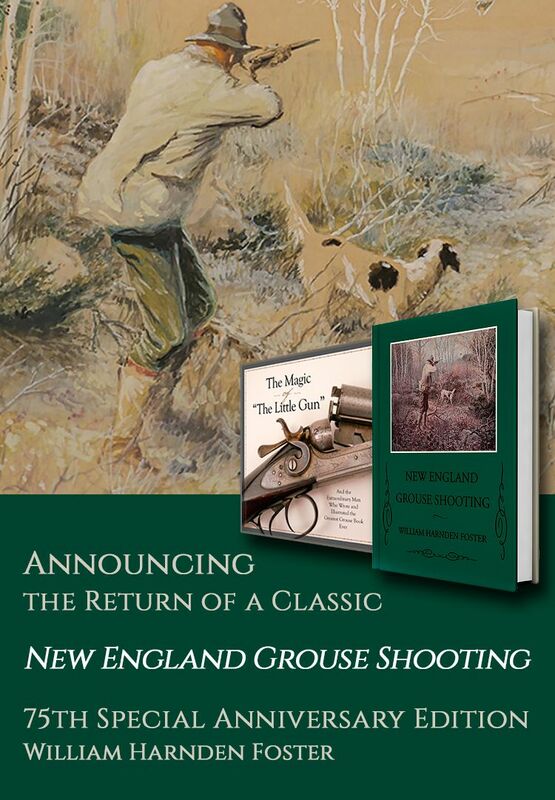 New England Grouse Shooting is a wonderfully captivating book by an erudite and educated bird hunter who experienced the heart of the golden era of ruffed grouse hunting, when market hunting was vanishing and a new sporting ethic was emerging. Indeed, Foster played an influential role in shaping that ethic. This is the masterpiece to which dedicated upland bird hunters return again and again, for inspiration and a reminder of those good old-fashioned feelings about why we love the sport.